Looking for a healthy breakfast to keep you going through long days of holiday preparation? Two tablespoons of maca powder, two tablespoons of cacao powder, two cups milk (nut, hemp, or rice), one tablespoon of sweetener (honey/maple – optional), one tablespoon of chia seeds, hulled hemp seeds or chia protein powder. = Fresh fruit of your choice. = Let sit for 5 minutes to thicken chia seeds and soften the goji berries. = Add remaining ingredients and mix well. We sell a number of superfoods by Foods Alive in our office. We often get questions about what they are and how to use them. So, we decided to elaborate! Enjoy the below and check the link at the bottom for recipes. As always, we are here for questions and honored to be on your health journey with you. 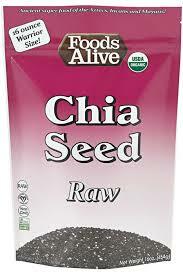 Chia Protein is crafted by carefully separating the oils from the seeds. This creates a wonderful high protein and high fiber product that can be added to a variety of different foods. 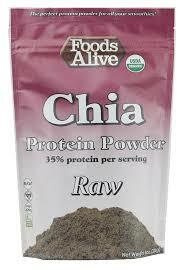 Chia Protein is a very nutritious addition to protein shakes, smoothies, cereals, porridge, yogurts and more. It can also be used as a partial substitute for flour. Chia Protein is loaded with an abundance of nutrients such as calcium, protein, anti-oxidants and dietary fiber and also contains all the essential Amino Acids to provide a nutritional punch! One Tablespoon of chia protein mixed into three tablespoons of water may serve as a replacement for one egg in baking by binding the other ingredients together. 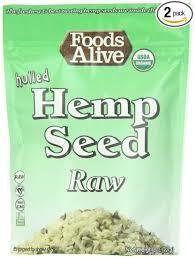 Hulled hemp seeds provide all the nutritional benefits of whole seeds without the crunchy hull. They taste similar to that of a pine nut or sunflower seed and can be eaten as a snack or added to your favorite soups, sauces or dips. Packed with Omega-3 & 6 EFA's Hemp seeds are one of nature's best sources for plant-based protein, containing all of the essential amino acids the body needs. Click the link above and download the PDF they offer. This list will help you prioritize your organic shopping list. Focus on getting the Dirty Dozen organic every time and don't worry about the Clean Fifteen!! Eat your fruits and vegetables! The health benefits of a diet rich in fruits and vegetables outweigh the risks of pesticide exposure. Use EWG's Shopper's Guide to Pesticides to reduce your exposures as much as possible, but eating conventionally-grown produce is far better than not eating fruits and vegetables at all. The Shopper's Guide to Pesticides in Produce will help you determine which fruits and vegetables have the most pesticide residues and are the most important to buy organic. You can lower your pesticide intake substantially by avoiding the 12 most contaminated fruits and vegetables and eating the least contaminated produce. Blog Series - Organic: How does organic protect future generations? Blog Series - Organic: How Organic Is it? Blog Series - Organic: Why is organic more expensive? Blog Series - Organic: What does organic really mean?